Wenger's Essential Lab Workstation modern design for compact space and collaboration. Just because you don’t have a lot of space doesn’t mean you don’t have a lot of needs. In fact, just the opposite is true: You need special, tight-fitting solutions that keep working. Essential Lab Workstation is the perfect fit. It is beautifully built and built to last, with all the great workstation thinking and durability that differentiate Wenger. It’s also built to fit, giving you a range of widths from 32" to 49" (81cm to 124cm) sure to accommodate your space and budget. Modern Technical Design – One look says, sleek and smart. It has efficient space for PC’s, iMacs, iPads, and keyboards. Enhanced Collaboration – Now, sharing inspiration is easier than ever. The C-shaped frame opens leg room under adjoining stations for a tighter, more engaged setup. Robust Construction – It’s elegant but tough, engineered to hold up to 175 lb. (78 kg.) of equipment with rock-solid stability. The 3⁄4" (19 mm) wood desk is reinforced with a 14-gauge steel profile. The welded 16-gauge tubular steel frame has internal steel counterweights for added strength. Designed to withstand years of student use. Space Efficient – This design is pure streamlined strength. The compact size and proprietary frame create a smaller footprint and require less aisle space. 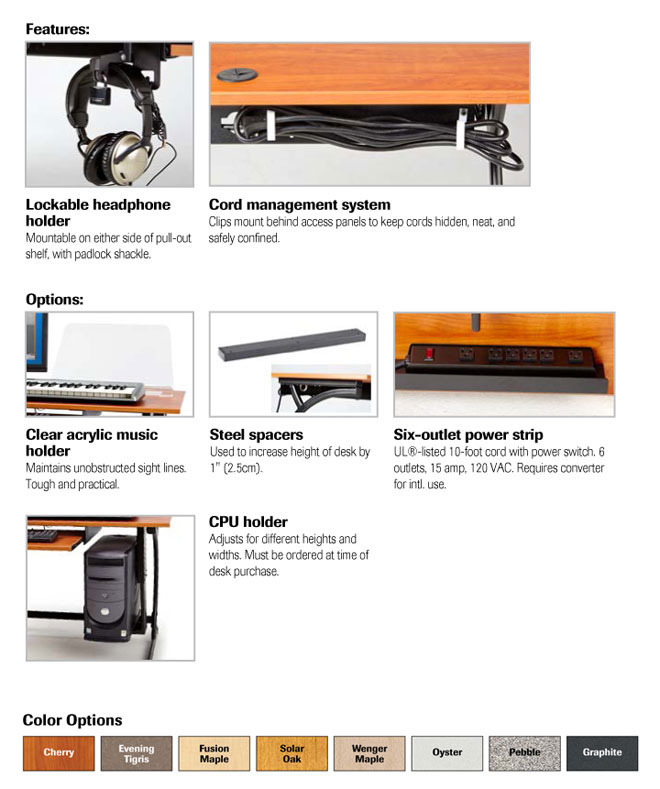 The solid desk and pull-out shelf optimize equipment. Features like the lockable headphone holder add value. It is the essential design for limited space. Our Essential Lab Workstation can be configured to be as small as 32” wide. For programs with limited space, using small keyboards or ipads, this is a great solution. Please call your Wenger representative so that we can understand your needs in order to provide the best solution and an estimate to help you budget your investment.